Hi @Tim. Have you had your SSL turned on for both machines? Could you be more specific? Please post step-by-step how to access the setting you are referring to. The "Use SSL encryption" setting in the "Network Security" group is unchecked and disabled. What firewall software do you have? How are your machines connected to the network (wired or wireless) ? My firewall is Norton Security Deluxe. 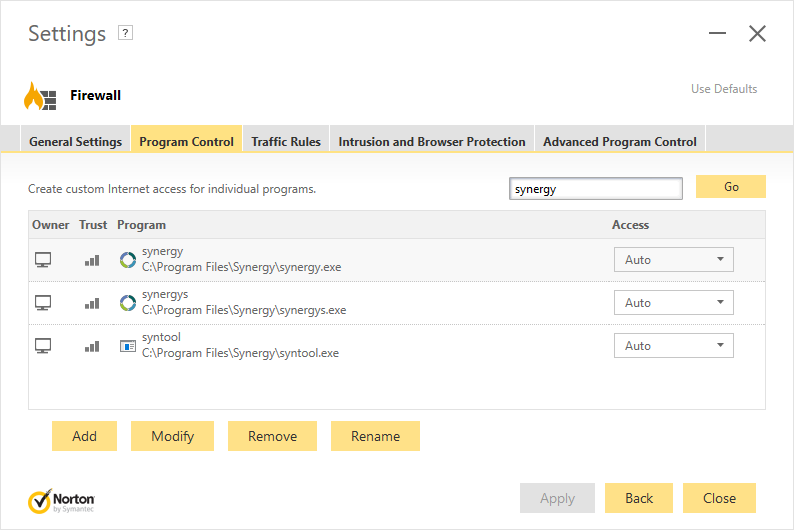 In the Program Control tab of the Firewall settings 'synergy', 'synergys', and 'syntool' access is 'Auto' (picture attached). Do you have an option to allow it instead of having it on Auto? I set the firewall settings to ALLOW for both client and server PCs. The mouse cursor is no longer jittery. However, the left mouse button click issue remains. I must frequently return to the client screen and left click somewhere to re-enable the left mouse button for the mouse cursor on the client. Can you press scroll lock while the cursor is still in the server's monitor then try to use it normally. Try to check if it still does that. When scroll lock is enabled on the server it prevents the mouse cursor from leaving the server screens and entering the client screens. Disabling scroll lock returns the mouse to normal multi-system functionality. You have Windows on both machines right? Server is Windows 10 Pro, version 1607, OS build 14393.1198 (about to be upgraded to Windows 10 Creator, version 1703). The mouse is still jittery. The client still ignores left mouse clicks after a period of time. Have you tried switching the machine with Windows 10 creator update to be the server? Both machines have been upgraded to Windows 10 Creator (version 1703) for a couple of weeks now. You said that one of the machines is connected via Ethernet cable. Is it the server or the client? The server is on Ethernet cable. The client WiFi. Have you set the Wi-Fi network to be recognized as Private network? or is it set as Public network? Which Windows 10 setting would you like to know about? Go to Network and Sharing Center and check the network type of the network you are connected to. It is under the network name. Can you open "Allow an app through Windows firewall" and check what type of networks are set to allow Synergy connection. How do I open "Allow an app through Windows firewall'? And where do I go to check? Press the Windows button and type in allow. Click "Allow an app though Windows Firewall." Synergy is allowed to communicate through the Windows Firewall for both Private and Public on the client and the server.